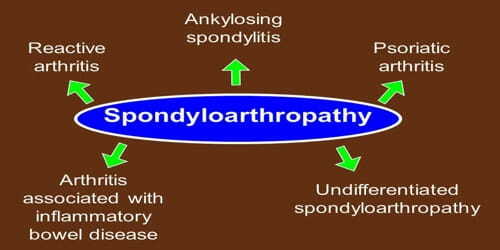 Definition: Spondyloarthropathy or spondyloarthrosis refers to a group of inflammatory rheumatic diseases that includes ankylosing spondylitis and psoriatic arthritis. As such, it is a class or category of diseases rather than a single, specific entity. It differs from spondylopathy, which is a disease of the vertebra itself. 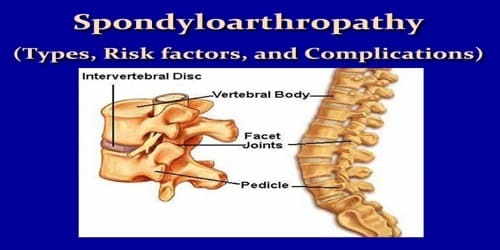 However, many conditions involve both spondylopathy and spondyloarthropathy. Spondyloarthropathy can be classified as either axial or peripheral. The axial form affects mostly the pelvic joints and spine. The peripheral form affects the limbs. The condition may also cause inflammation in the eyes, gastrointestinal tract, and areas where ligaments and tendons attach to our bones. Spondyloarthropathy with inflammation is called axial spondyloarthritis. Non-vertebral signs and symptoms of degenerative or other not-directly-infected inflammation, in the manner of spondyloarthropathies, include asymmetric peripheral arthritis (which is distinct from rheumatoid arthritis), arthritis of the toe interphalangeal joints, sausage digits, Achilles tendinitis, plantar fasciitis, costochondritis, iritis, and mucocutaneous lesions. However, lower back pain is the most common clinical presentation of the causes of spondyloarthropathies; this back pain is unique because it decreases with activity. Spondyloarthritis is serious. But with the right coping strategies and a consistent treatment plan, most people with the condition live full lives. Reactive arthritis often develops after an infection in the urinary tract or digestive system. It tends to attack joints in the lower limbs. Psoriatic arthritis affects major joints of the body, as well as the fingers and toes, along with the back and pelvis. It typically happens to people who have a skin condition called psoriasis or who have family members with psoriasis. Undifferentiated spondyloarthropathy produces symptoms that aren’t as specific as other illnesses in this family. It sometimes develops into a more identifiable form of the disease. Enteropathic spondyloarthropathy. People who have a digestive tract illness like Crohn’s disease sometimes get this condition. About 1 in 5 people who suffer from Crohn’s or ulcerative colitis will get this form of spondyloarthropathy. Reiter’s syndrome is a type of reactive arthritis that happens as a reaction to an infection in another part of our body. It can include redness, joint swelling, and pain, often in knees, ankles, and feet.